Opposition party, the National Demcratic Congress (NDC) has denied owning any political militia association, popularly known as vigilante groups in the country. The rejection of claims of vigilante groups been affiliated to the NCD was made by Member of Parliament for the Ningo Prampram Constituency, Samuel Nartey George, who appeared before the Emile Short Commission investigating the violence that characterised the January 31 by – elections in Ayawaso. According to the MP, these groups are individually owned and no official record of the NDC recognises such formation, referring to them as “community – based organisations”. Giving his testimony before the Commission, Sam George, who was assaulted during the day of the election claimed the attackers who have been said to be men of the National Security operatives, are rather members of the governing New Patriotic Party’s invincible forces (a vigilante group). “What I know for a fact and can state without equivocation is that the party I belong to –the National Democratic Congress – does not have any vigilante group. The two groups I told you I was familiar with; Azorka boys and Hawks are groups that hold allegiance to individuals. I will not refer to them as vigilante groups but community-based organizations. So, let me state for the record that the NDC has no vigilante group.” – Sam George’s words. “These are groups that have been put up by individuals, but they are not recognized or affiliated to the NDC. 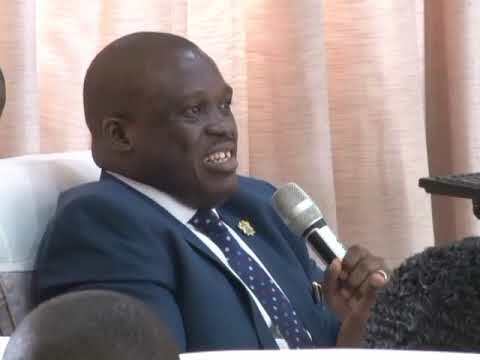 The NDC is a body corporate in law that has a constitution with procedures of affiliations for groups that are not part of the NDC,” he stressed. His comments are in sharp contrast to those of the party’s National General Secretary, Johnson Asiedu Nketsia, who endorsed such groups within the NDC September last year. The General Secretary in an interview with Joy News intimated that, the formation of a vigilante group, the Hawks, is “an appropriate natural response” to the failure of the Akufo – Addo government to rein in its party militia. He further stated that, “I endorse it fully”, the NDC mastermind refused to condemn the Hawks who emerged at the Ashanti regional congress. Other groups include ‘The Dragons’ based in the Brong Ahafo region and ‘The Lions’ based in the Eastern region. However, following the Ayawaso West Wuogon clashes and a subsequent incidence which led to the shooting and killing of one person and another individual injured at the Ashanti Regional Head Office of the NDC, calls have heightened for the disbanding of the vigilante groups in the country. In response to the growing calls by Ghanaians, Civil Society Organisations and International bodies for the NPP and NDC to disband their militia groups, president Akufo Addo, in his Thursday, February 21, State of the Nation Address, called on leaders of both parties to meet and see to the end of the formation and operation of such groups. “I want to use the platform of this Message to make a sincere, passionate appeal to the leaders of the two main political parties in our country, NPP and NDC, to come together, as soon as possible, preferably next week, to agree on appropriate measures to bring an end to this worrying and unacceptable phenomenon of vigilantism in our body politic,” – he said. The president added that, he will institute legislation should the parties fail to disband the vigilante groups. Meanwhile, the West Africa Network for Peace – building (WANEP) has cautioned political parties that, activities of these groups has the tendency of destabilising the country. He expressed, some politicians are ‘playing the ostrich’ on the existence of these groups.